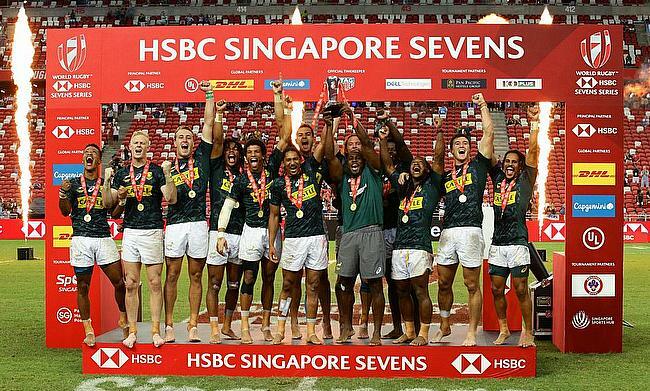 South Africa made a terrific second half comeback where they scored 20 unanswered points as they edged out Fiji 20-19 in a thrilling final at National Stadium to clinch the Singapore leg of the HSBC World Rugby Sevens Series. Fiji the winners of Cape Town, Hamilton and Hong Kong legs looked set to win the Singapore 7s once again after a terrific start that saw them score three first half tries with Aminiasi Tuimaba (2'), Napolioni Bolaca (5') and Vilimoni Botitu (7') dotting down. Bolaca also slotted two conversions as Fiji scored 19 points in the first half. South Africa finally responded back in the 10th minute with replacement Kurt-Lee Arendse crossing over the line and in successive minutes Angelo Davids and Ryan Oosthuizen also touched down. Selvyn Davids managed just one conversion as the scoreline was 17-19 with the end time approaching. Nevertheless, Davids held his nerve and kicked the decisive penalty goal in the 14th minute to complete a thrilling one-point victory for South Africa. Meanwhile, England went on to defeat USA 28-7 to win the Bronze while France edged out Scotland 19-22 to win the Challenge final. USA continue to top the table with 145 points while the runners up of Singapore 7s are at second place with 142 points with New Zealand, South Africa and England occupy the next three places with 130, 121 and 107 points respectively.